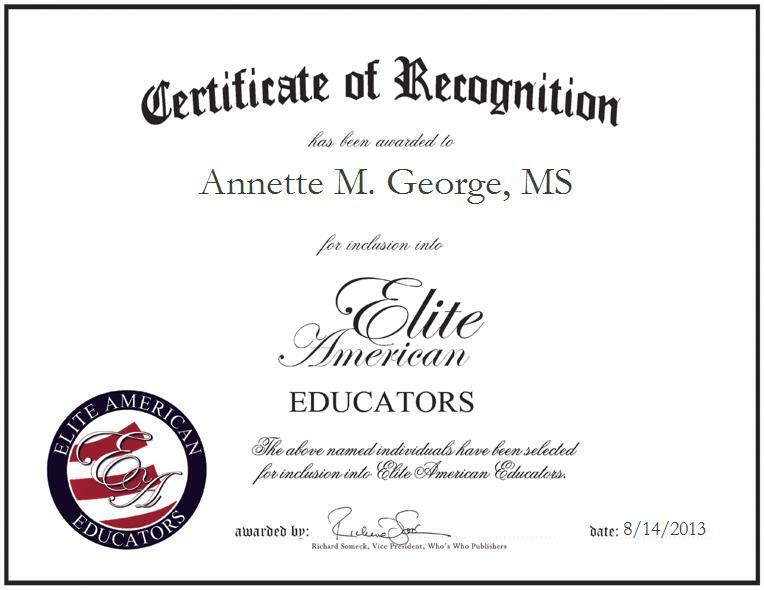 Annette M. George, MS is a Special Education Teacher serving the Kent School District. With her sophisticated and diverse skill set, Ms. George shines as a luminary in her field, making the most of her years of experience and a love of what she does. She is responsible for monitoring children’s activities in learning daily living activities, and teaching reading, writing, mathematics, Spanish and sign language. She has taught in Texas and Washington for the past 25 years. Among her many professional feats, Ms. George marks working in the suburban community as a speech therapist for the deaf, and learning Spanish and sign language to supplement her skills as a major highlight in her career. She feels that the most gratifying aspect of her career is watching senior students cross the stage at graduation each year.